Before wool can be spun, it first needs to be washed, dried and carded or combed. 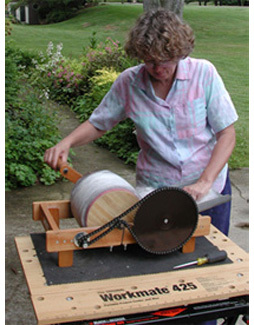 Although she has a collection of vintage wool cards, Elizabeth is shown here using a mechanical drum carder. The carder aligns the wool fibers to make a smoother spun yarn. The mechanized device is a real time-saver as well as a hand-saver. Elizabeth purchased this item many years ago after carding just one fleece with hand cards. Wool can also be spun "in the grease," meaning unwashed, but carding only works with washed fibers. Hand cards are used to straighten the fibers before spinning. Small clumps of fiber (washed wool, cotton, etc.) were caught on the bent teeth of one card. This card was then held on the spinsters knee and the other card was used to brush out the tangles similar to brushing hair. Cotton cards have teeth set close together while wool cards have teeth twice as far apart. Tow card can be seen on the flax tools page. The job of carding was frequently given to children and older adults. The above and below images are of cotton gins that were used to process cotton grown for personal use. The cotton with seeds was removed from the bolls and fed between the rollers. This was a two-man operation, with one person rotating the handle and one person feeding in the cotton. The rollers pulled through the cotton, but left the seeds behind. This type of gin worked on cotton that easily separates from the seed. The majority of cotton grown requires a larger saw gin to remove the seeds which are firmly attached to the lint or fiber. It was called a saw gin because the blades in it looked like saw blades. 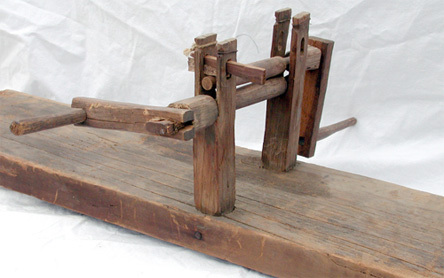 Eli Whitney's cotton gin was a saw gin. 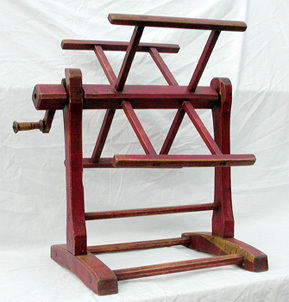 This primitive model of a cotton gin was found in Brasstown, NC. The dealer selling it had no idea what it was, but was offering a $5 discount to anyone who could tell him what it was. Elizabeth told him she was pretty sure it was a cotton gin. This item became a topic of conversation and opinions ranged from a bean sheller to "gee, I don't have a clue." A class at the Folk School about a year later solved the mystery. An instructor from Tennessee discussing historic fabrics showed a photo of almost the exact item and said it was used to process cotton in the Tennessee area that was grown at the end of the garden. Spinning fingers were used with the walking wheels. 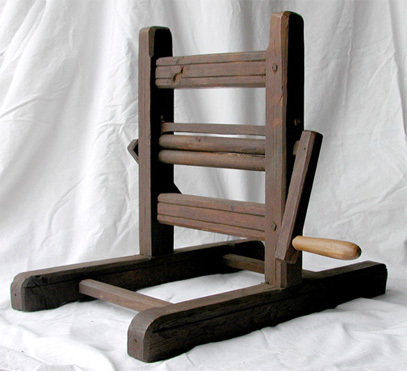 The stick of wood about 8 inches long was used to extend the spinsters reach turning the wheel, this producing a longer thread. We have seen this item described as both a yarn blocker and a large bobbin. 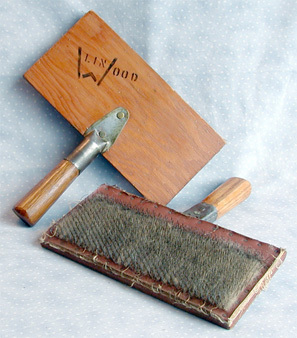 A yarn blocker would have been useful for winding on a wet spun linen thread or washed wool thread and letting it dry. Worst book on spinning describes the use of this item a large bobbin, serving the same purpose as a spoon on a warping scarne. Large amounts of thread can be wound on this bobbin. It was then stood on the floor and used to make a warp.